Welcome to Newcastle, Prince George Ocean ~ 629 Beach Bridge Road, Pawleys Island SC. 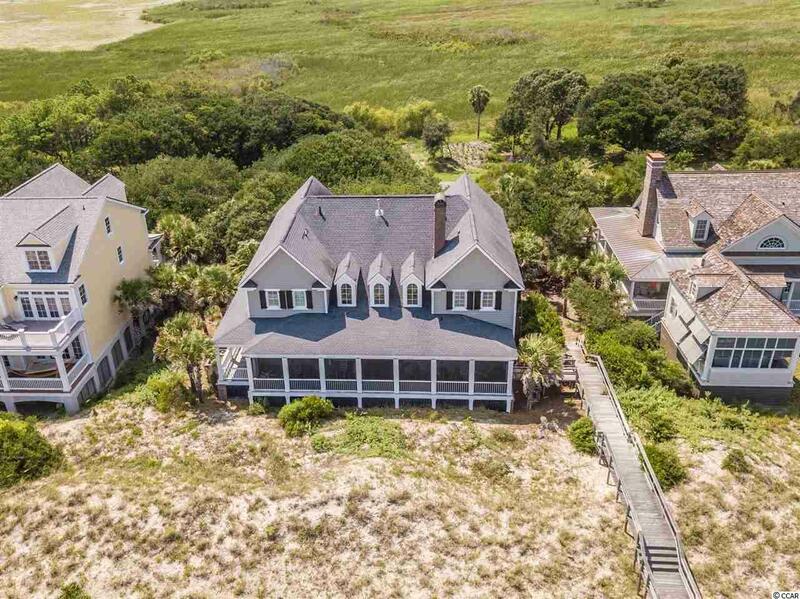 From the moment you drive under the canopied live oaks and enter this timeless home you will find yourself captivated by the natural landscape and beautiful Atlantic Ocean! This classic oceanfront custom home was a labor of love and a family affair. It was designed by award winning Catalyst Architects, and built by the current owner, with interior design done by the home owners daughter, Pebbles Nix, of GLENN EPTING Interior Design, Inc. The home was designed with all attention directed toward comfort and convenience, while highlighting the spirit and beauty of the sea and natural windswept landscape, making sure that every room had a beautiful view. An inviting Great Room features built-in book cases that flank a fireplace with an antique mantle from the upstate of South Carolina. The oceanfront Master Bedroom wing creates a great escape with unique and private his and her baths along with a sitting/dressing room that could easily be a nursery. The formal dining room is generous in size with antique pine pieces and a custom pine dining table that seats 10 and conveniently connects to the kitchen, which was recently updated with new quartz counter tops and has plentiful storage and counter space. The center island seats up to 4 people and includes custom made swivel bar stools sporting various lowcountry scenes. This inviting space is one of fun and fellowship where all can enjoy afternoon snacks or where the chef in the home can prepare yummy southern dishes while enjoying lively conversation with family and friends! Beautiful cypress walls and book shelves in the study allow for privacy and even work when necessary. The upper floor features four bedrooms with private baths, an additional middle room for sleeping or lounging along with a second laundry and large center living area. Other distinct features through out the house are an elevator to all floors, 4-car garage, salvaged heart pine floors, double crown molding, tongue and groove walls and inverted bead board ceilings, custom window treatments with Designerâs Guild and Robert Allen fabrics and classic antique glass door knobs. The inviting porches capture ocean breezes, colorful sunsets and shoreline views ~ it will be a joy to call this home! Directions: Turn Into Prince George Ocean, Gated Entrance Call Listing Agent For Code, Follow Vanderbilt And Turn Right Onto Beach Bridge Road, House Will Be On The Left.